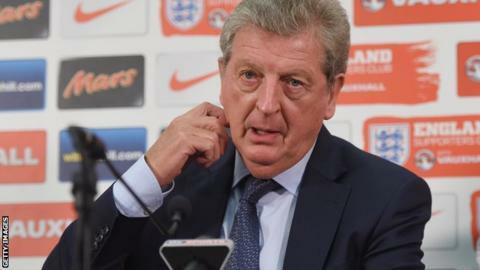 England manager Roy Hodgson insists his side are "not heading to mediocrity" as they prepare to begin their Euro 2016 qualifying campaign next month. England, who failed to progress past the World Cup group stage, take on Switzerland away on 8 September. Slovenia, Estonia, Lithuania and San Marino are the other teams in Group E.
"I don't think that way. I don't think we're heading for mediocrity. I think there's great potential. There's hope," said 67-year-old Hodgson. Hodgson's team have dropped to 20th in the world rankings after their disappointing display in Brazil, where they lost to Italy and Uruguay before earning a point against Costa Rica when they had already been eliminated. Despite that, he believes England face a "relatively easy" task of reaching the finals which will be held in France. An expanded format sees the two top teams from each group progress into the 24-nation finals. Their qualification campaign starts in Basel against the Swiss, who are ranked ninth in the world and were narrowly beaten in the World Cup last-16 by eventual finalists Argentina. "We're being labelled or I'm being accused of leading England to being a second-rate country. If that's the case, then a draw is a fantastic result over there in Switzerland," Hodgson, who managed the Swiss between 1992 and 1995, told reporters. "If that's your real opinion, that we're heading towards mediocrity, maybe you shouldn't be expecting us to win matches against Switzerland, who had quite a good World Cup, and have a very experienced team." Hodgson also criticised a number of British newspapers that claimed he had compared England favourably with world champions Germany. "The point I made, and I can almost quote it verbatim, is that there is nothing in the way Germany play, nothing in the way they approach the game, nothing in the system that they use, that we can't do," he said. "Don't try to make me out to be some complete fool, who after getting knocked out in the first round says we are as good as the team that won it. That's wrong." Manchester United striker Wayne Rooney will lead England against the Swiss after being appointed by Hodgson as his new captain. Hodgson also named four uncapped players - Arsenal's 19-year-old defender Calum Chambers, plus 24-year-old trio Jack Colback of Newcastle, Tottenham's Danny Rose and Aston Villa's Fabian Delph - in his squad.